Burmese cuisine is not too common in the States, although there are a couple of places in the DC metro area which serve it. In a nondescript strip mall in Falls Church Virginia, you will find one of them: Myanmar Restaurant. I’ve always found Burmese cuisine to be a cross between Indian and Thai, although perhaps there is a bit of Vietnamese taste as well. Looking at the country’s location on the map shows that the cultural similarities makes sense. But make no mistake, Burmese cuisine is a thing of its own, making for a unique dining experience. 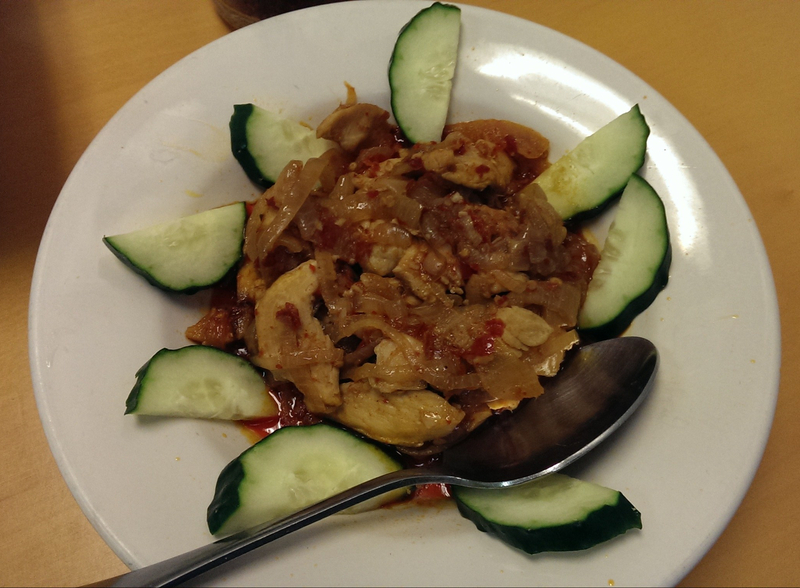 The restaurant has the full array of Burmese cuisine from appetizers, soups, and salads. Burmese salads are made from sliced cabbage instead of lettuce, mixed with other ingredients such as shredded mango, papaya, or even green tea, and topped with a spicy vinaigrette. They are quite delicious and make for a good light meal. Appetizers include fritters of various kinds, fried tofu, and spring rolls. Soups include Asian versions of chicken, fish, vegetable, including a personal favorite: lemongrass. When going to a restaurant like this, it is best to go with a group so you can try more of the recipes. That is exactly what we did. 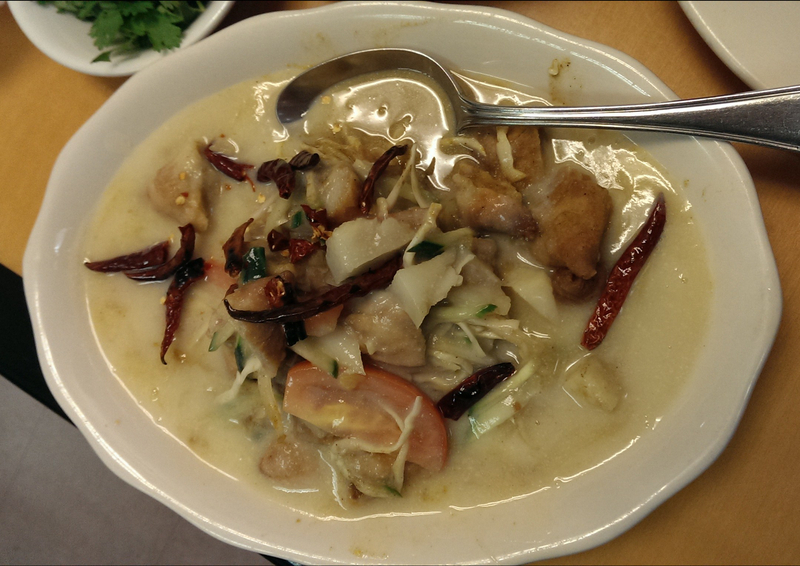 We started off with Mohingar, a fish soup served on top of noodles. This is a hearty and flavorful soup chock full with meat and vegetables. This was followed up with the chili chicken — a very spicy dish which thankfully was offset by a refreshing side of cucumbers. 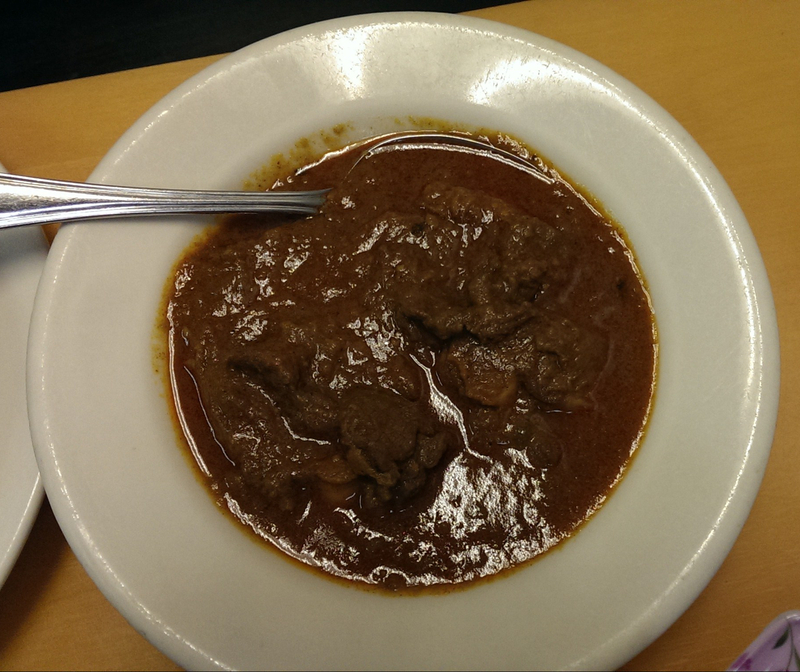 The meal was rounded out with mutton curry and a samosa salad. The curry was heavily spiced, but not spicy hot. Samosas are triangular shaped stuffed pastries filled with either a vegetable or meat stuffing, common in Indian and other east-Asian restaurants. We went with a vegetable stuffing. I’ve had samosas often in Indian restaurants, but I’ve only seen samosa salads at Burmese restaurants, and this was the only place where I’ve had it with a creamy white sauce. It was delightful, and balanced out the spicy meal quite well. If you are an adventurous eater and are looking for something out of the ordinary, I recommend giving Myanmar a try.